Irish Metal Merchants Stormzone are back with their brand new release 'Seven Sins'. It's a story based album that deals with dark subjects such as child abuse and cruelty to the disabled, whilst still sending out a message for justice, hope and forgiveness. 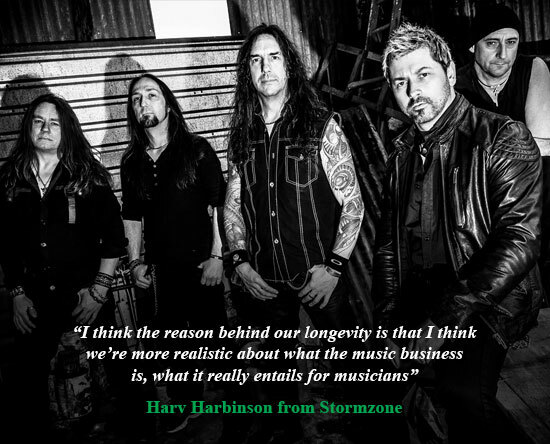 Ian Johnson called the band's singer Harv Harbinson at his home in Spain to talk about the new album and its strong subject matter. I agree and I think the reason for it is that for the first time ever, the music on this album was written by just two of the band members. For this album Steve Moore, our guitarist, and Kevin McNulty, our bass player, wrote all the music between them. Which has given the album a much more concentrated sound structure and believe me when I say that when the guys were sending over the tracks for me to hear, I was just blown away with what they were coming up with. That intensity you mentioned and how they'd really upped their game was just wonderful to hear. I knew then that I would have to up my game with the lyrics to match what they'd done and so their music I think, brought the best out of me as well. So tell me about the story behind 'Seven Sins'. Well as some of your readers will know I've written about Dr. Dealer before, he's been a warrior, a Celtic King, a Conan like character and so when I'd heard this music I started to think of where I could place Dealer on this album. Out of that came the story of a 19th Century Wild West medicine show with Dr. Dealer as a snake oil salesman who sends helpers out to the townships he's about to visit and finds out whose abusing and hurting children and disabled people. When he's done that he sets up his show and whilst the townspeople are watching it, he rescues these children and punishes the evil parents and people who are hurting them. I wrote the first song about this story and then another one came and then another and before I knew it I had that dreaded thing (laughs) a concept album. Though I really feel it's more like a set of short stories set to music. Subconsciously I think because I received all the music first, it was easier for me to write lyrics for it. As you mentioned you deal with some very strong subjects on this album. Child and disability abuse, abusers getting their just punishment and in the end the saving of souls. What made you want to write about these subjects? To be honest I'm not sure. As you said they are very strong subjects but maybe, and again subconsciously, just before I started to write the lyrics for the album I found out I was going to become a father again. So maybe some chemical reaction started to kick in and my ultra protective nature kicked in as well – that, I've got to protect my kids no matter what, feeling. That maybe informed my writing, with Dealer becoming a Pied Piper like character who goes into town and ends up helping the children there. Though to be honest when I first started to write the lyrics this story hadn't occurred to me but being told your going to be a Dad changed all that. I know it's dark subject matter but some of the songs are about being saved, redemption, hope and salvation, which kind of balances the whole thing out. Are your protagonists like Dr. Dealer and Bathsheba based on anybody you know, or is it all pure imagination? What happened was, and if you don't know I'm an artist as well as a singer, I'd drawn some sketches for a book based on the legends and myths of Ireland which will be published next year. One of the sketches depicts a legend about an Irish vampire but of course with no evidence about his appearance it's all down to reading the stories and then guessing what this thing might have looked like, then going away and drawing what I saw in my mind's eye. So whilst I was writing my lyrics for the new album, the drawings I'd been doing came to mind and those images lent themselves to the characters who live with Dr. Dealer and make up the 'Seven Sins' album. So long answer short, it's all my imagination. Now I know you're an artist, have you thought about either making an animated movie or graphic novel based on your artwork to accompany the album? First of all there is a short animated lyric video movie being done to accompany one of the songs called 'Another Rainy Night'. It uses my artwork as the background to the video. We'll also be doing short movies on the website that will explain each of the songs, which has me sitting on a throne and explaining each track in the lead up to release, these have lots of dark imagery and lighting and they look really good. When we scripted these videos and worked out the songs there was enough there for us to do a short novel but whether that happens is up in the air. It would be a great thing to do though. You just have to wait and see if someone wants to run with the idea. No disrespect to you Harv as you're the main singer for the band, but was it ever discussed that you would use outside vocalists to play the various characters? To be honest, one of my favourite bands in the world is Avantasia and just after we'd finished the recording of the album I realised that doing this live would be tough on me as a singer. Take 'Seven Sins', it's almost seven minutes long and has multiple character parts and doing that every night gets tough. So yes if we could, I would love to have guests singing the various parts and they would help to flesh out the album. I love the idea of someone jumping in and letting me sit back for a minute then I'd join in again. Would this be done in a live situation, say a big show with different people playing parts and with a stage show to match.? It would, and wouldn't it be great for us to be able to play the whole of the 'Seven Sins' album with a host of guest vocalists playing Bathsheba and the others. Plus being able to do it as a kind of full on stage production would be fantastic, hopefully that will be something we can do in the future. On the special edition of the album there are four bonus tracks that help fill out the story, so adding them to the show would make the whole experience even better. It's something I think we really have to look into. I wonder if Jorn Lande and Robin Beck a free? What about filming it then, something like this needs to be recorded for posterity! Again that would be something that would be great to do. Though I would insist on it being done properly; multi cameras, costumes, video segments and a decent sound desk would be the minimum we'd need, but filming the show would be something I think the whole band would love to get involved with. Hopefully one day it will happen. So what about just a tour without all the bells and whistles Harv? We are trying to put something together for the end of the year, we definitely want to get back to the UK and play there again. If we don't we're selling both ourselves and our fans short. To actually sell CD's these days you have to tour, if you don't your done. We've always loved playing live ever since our first gig at Firefest, which started everything off for us, so we want to get out on the road and show everyone just what we can do. Finally what's the secret behind Stormzone's longevity? You've been together for more than ten years now and these days that's a rarity. Well another journalist asked me the question, "which of the seven sins have you committed?" My answer to your question and theirs is probably lust and envy. Lust because the first gig I went to, which was Motorhead, Iron Maiden and Saxon at Bingley Hall, made me lust after what these guys were doing, which was playing wonderful Metal music. I knew that's what I wanted to do with my life. Then envy because I really envied those Rock stars because I so wanted to be like them. Now I am here, though not a Rock star (laughs), I think the reason behind our longevity is that I think we're more realistic about what the music business is, what it really entails for musicians. We've had our setbacks but we stuck it out and we genuinely like each other, which helps and even with five albums recorded, all we want to do is make five more.